The Justanid dynasty of Daylam was founded in 189/805, and one of its rulers, called Wahsudan bin Marzuban (d. 251/865) is reported to have built the fortress of Alamut in 246/860. The tradition in this context has it that once the ruler, while on hunting had followed a manned eagle which alighted on the rock. The king saw the strategic value of the location and built a fort on the top of a high piercing rock and was named aluh amut, which in the Daylami dialect, derived from aluh (eagle) and amut (nest), i.e., "eagle's nest" as the eagle, instead of following the birds, had built its nest on that location. According to "Sar Guzasht-i Sayyidna", the term "Alamut" is aluh amut i.e., the eagle's nest, and an eagle had its nest there. Ibn Athir (d. 630/1234) relates another tradition in his "Kamil fi't Tarikh" (Beirut, 1975, 10th vol., p. 110) that the eagle had taught and guided the king to this location, therefore, it was named talim al-aqab (the teaching or guidance of an eagle), whose rendering into Daylami dialect is aluh amut. The word aluh means "eagle" and amutis derived from amukhat means "teaching". The people of Qazwin called it aqab amukhat (the teaching of eagle). Thus, the term aluh amut(or aqab amukhat) later on became known as Alamut. The Iranian historians have drawn attention to the curious fact that, if one gives to each letter in the full name of Aluh Amut, its numberical value in Arabic, the sum total amounts to 483, which represents the year in which Hasan bin Sabbah obtained possession of Alamut. Afterwards, the Musafirid dynasty, also known as Sallarids or Kangarids (304-483/916-1090) founded by Muhammad bin Musafir (304-330/916- 941), who ruled from the fortress of Shamiran in the district of Tarum at Daylam and Azerbaijan. Later on, Mahdi bin Khusaro Firuz, known as Siyahchashm, retained the occupation of Alamut in his hands. He was however defeated by the Musafirid ruler, Ibn Musafir in 316/928 and henceforward, there is no historical indication about the fate of Alamut following the death of Ibn Musafir in 319/931. It must be noted on this juncture that most of the sources write that Mahdi bin Khusaro Firuz had embraced Ismailism, which is quite an erroneous view. He had however espoused the dotrines of the Qarmatians, not that of Ismailis. When Hasan bin Sabbah arrived in Iran from Egypt, the fortress of Alamut was in possession of an Alid, called Hussain Mahdi, who had it as a fief from the Seljuq sultan Malikshah. Hasan Mahdi was a descendant of Hasan bin Ali al-Utrush (d. 304/916), one of the Alid rulers of Tabaristan, also known as al-Nasir li'l-Haq, who had established a separate Zaidi community in the Caspian Sea. It is related that a dai Hussain Qaini, working under Hasan bin Sabbah had created his friendship with Hussain Mahdi. The Ismaili dais also converted a bulk of the people around the territory, and became powerful to some extent. These Ismailis also began to come in the fortress. Knowing this, Hussain Mahdi expelled them and closed its doors. Finally, Hussain Mahdi was compelled to open the doors owing to the multitude of Ismailis in the vicinity. 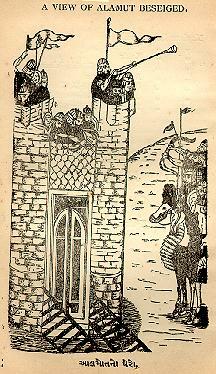 Hasan bin Sabbah moved to Ashkawar and then Anjirud, adjacent to Alamut, and on Wednesday, the 6th Rajab, 483/September 4, 1090, he steathily entered the castle of Alamut. He lodged there for a while in disguise, calling himself Dihkhuda and did not reveal his identity to Hussain Mahdi, but as the days rolled away, the latter noticed that he was no longer obeyed, that there was another master in Alamut. The bulk of Alamut's garrison and a large number of the inhabitants had embraced Ismailism, making Hussain Mahdi powerless to defend himself or make their expulsion, but himself eventually left the fortress. Thus, Alamut was occupied without any massacre and was taken to be known as Daru'l Hijra (place of refuge) for the Ismailis in a congenial atmosphere. Ata Malik Juvaini (1226-1283) had seen the fortress of Alamut when it was being shattered in 654/1256. He writes in "Tarikh-i Jhangusha"(tr. John A. Boyle, Cambridge, 1958, p. 719) that, "Alamut is a mountain which resembles a kneeling camel with its neck resting on the ground." It was situated in Daylam about 35 km. north-west of Qazwin in the region of Rudhbar. It was physically a large towering rock, with steep slopes hardly negotiable on most sides, but with a considerable expanse at its top where extensive building could be done. Situated in mountainous terrain, it approaches could be guarded with relative ease. Its present location lies about 100 k.m. north-west of Tehran, and situated in the high peak of Elburz mountain. Alburz generally was pronounced as Elburz, is the name given to great mountain range, dividing the high plateau of Iran from the low lands of Caspian Sea. The original Iranian word Alburz is derived from two Zand words, signifying the high mountain. The fortress of Alamut is 600 feet high, 450 feet long and 30 to 125 feet wide and is partly encompassed by the towering Elburz range. The rock of Alamut is known at present as Qal'ai Guzur Khan. Hasan bin Sabbah's immediate concerns, however, were to refortify Alamut, provide for it food and water supply, construct cisterns and store-rooms for provisions, irrigate the field in the vally, acquire adjacent castles, erect forts at strategic points, institute economic and social reforms, unite the Ismailis by bonds of fraternity, and make every Ismaili feel himself a responsible member of the community and inseparable from it.